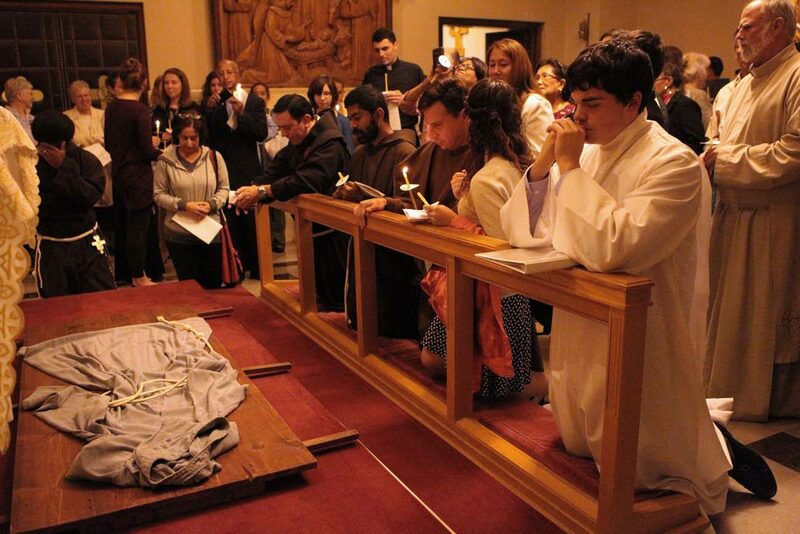 WASHINGTON (CNS) — Each Oct. 3, on the eve of the feast of St. Francis of Assisi, his followers around the world mark his “transitus,” or passing, from this world into eternal life. Sometimes there’s a re-enactment of the physical death of the popular saint and sometimes a habit is laid out on something that looks like a stretcher called a bier, reminding those present of Francis. The moment of his death can touch on the somber as much as the Franciscans, popularly known for their joy, can make it. But in Washington this year, St. Francis was very much alive to those gathered at the Franciscan Monastery of the Holy Land as many spoke of a revival of sorts taking place in the Franciscan order and one they owe to the world’s most famous Jesuit of our day. “We have to acknowledge a renewed Franciscan spirit in our world precisely because of this new Francis who has shaken up the church, shaken up the world and hopefully shaken up all of us,” said Franciscan Father Tom Washburn, referring to Pope Francis during the ritual known as the transitus. Pope Francis focuses, Perez said, on the lifestyle that many Franciscans, lay and religious, study and practice: a care for creation, a focus on mercy and the poor, and the importance of community. Those are values that go against the modern secular culture, which emphasizes individualism and the material, he added. But if you look closely, there’s something about the values laid out by the original Francis that are making a comeback, Perez said. “These values of poverty, humility, simplicity … these things resonated,” said Dunne. They were “the perfect antidote in a city like Washington, D.C.,” because it can be a place for those obsessed with power and money, she told Catholic News Service. Dunne is hoping to profess her vows as a Third Order Franciscan sometime this year. Third Order Franciscans, also known as tertiaries, are lay Catholics who make vows, participate in community activities and prayer, as well as good works. Father Jim Gardiner, a Franciscan Friar of the Atonement, said some in the general public find comfort and sweetness in the cute and popular notion of St. Francis surrounded by birds or other animals, but if you study his life and think about it, “he was subversive, really, in terms of the values of the world. He wanted to turn the world upside down.” That message is one that is affecting a modern world that finds itself surrounded by a reality and values that may not be as great as they seem, he said. “Deep down inside, they’re uncomfortable with the superficiality of today, the ramped-up consumerism, the racism, the stratification of society,” Father Gardiner said. The spirituality Francis set out offers freedom from that, he said. Francis fought for the poor, for peace in a time of war, and he dealt with the Catholic Church scandal, Father Washburn said to those gathered for the transitus ritual in Washington. So, this is the time to examine, Father Washburn said, what it means to be Franciscan in the modern age and what Pope Francis, in his embodiment of the Francis, the original, is calling followers, and even admirers, to do. “Eight hundred years later, this new Francis, our Holy Father Pope Francis, wants to propose it to us again, and if we follow where he wants to lead us, not in word, but in action, we will again change the church and change the world, if we first, again, change our hearts,” Father Washburn said. PREVIOUS: Relevant Radio airs novena from national shrine in Wisconsin across U.S.